The MACH Mini is a nice little machine. We liked the ability to stack scanners and the great portability. 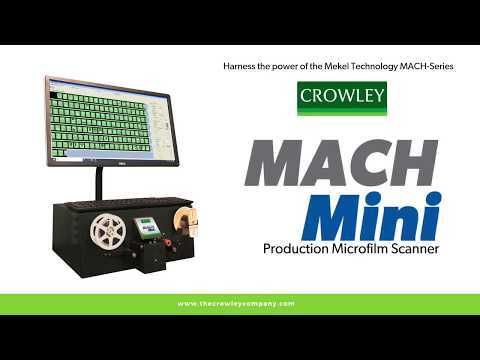 The Crowley Company introduces the MACH Mini, a compact revolutionary new microfilm scanner ideal for small-to-mid-sized service bureaus, archives, libraries and government agencies. Harnessing the production power of the acclaimed Mekel Technology MACH-series microfilm scanners, the MACH Mini uses minimal physical space while boasting the output volume, capture accuracy and high image quality of a much larger – and more expensive – microfilm scanner. Portability. The MACH Mini is small enough to be personally transported from department to department or off-site for branch or client scanning projects. The small footprint and rugged design of this portable microfilm scanner eliminate the costs and concerns of multiple shipments. Production. The MACH Mini’s included external PC ensures that downtime due to computer malfunctions is kept to a bare minimum. Swap PCs, not scanners! Laptop-compatible. The MACH Mini comes with an option to run from a dedicated laptop, further enhancing portability. Threading. The MACH Mini has a simple film transport path, making it easy to load all film types. The well-balanced tension system protects from the dislodging or separating of brittle microfilm sometimes caused by pinch rollers. Access. Scan it. Process it. Host it. Each purchase of a MACH Mini portable microfilm scanner includes a free trial of Crowley’s digital IMAGEhost microfilm hosting and viewing platform.